It’s normal for children to occasionally forget their homework, daydream during class or get fidgety at the dinner table. But inattention, impulsivity, and hyperactivity are also signs of attention deficit hyperactivity disorder (ADHD). This condition of the brain makes it difficult for children to control their behavior. If undiagnosed, ADHD can lead to problems at home and school, and can affect your child’s ability to learn and get along with others. To learn more about the symptoms and find answers to common ADHD-related questions, please click here for our detailed informational packet. The Quotient System. This innovative device objectively measures three core symptom domains of ADHD: hyperactivity, inattention and impulsivity. Based on research from the McLean Hospital, a Harvard Medical School Affiliate, this tool uses advanced motion tracking technology to track a child’s micro-movements while they complete a computerized test that takes about half an hour. Your child’s Quotient score will tell us how likely it is that your child has ADHD, as well as the relative severity of the disorder. CHADIS for ADHD. This evidence-based, comprehensive, online tool helps to improve the quality of ADHD care, improve communication with you and your child’s teachers, and assess children faster. If you believe your child would benefit from an assessment, please call us at 972-420-1475 and speak to the scheduler. You will then create a CHADIS account and complete a developmental questionnaire to begin the assessment process. Once your completed parent and teacher forms are received, we will contact you to schedule an evaluation. 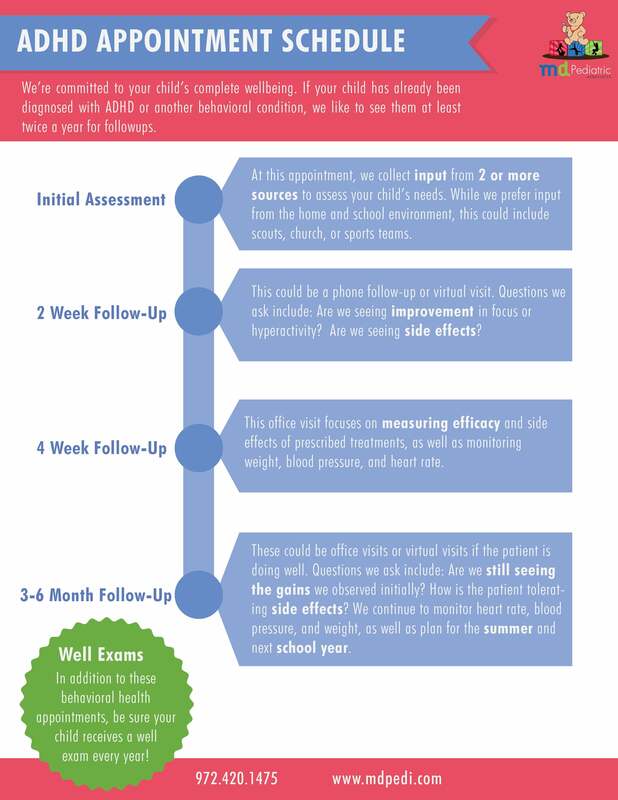 Click here for a graphic detailing the schedule and procedures for diagnosis and monitoring ADHD and behavior health conditions. For detailed instructions on how to setup a CHADIS account, please watch the following video featuring Saundra of our IT department. If you and questions, you can email her at sfitzgerald@mdpedi.com.